Refuge by Sanda Semeika © 2017. 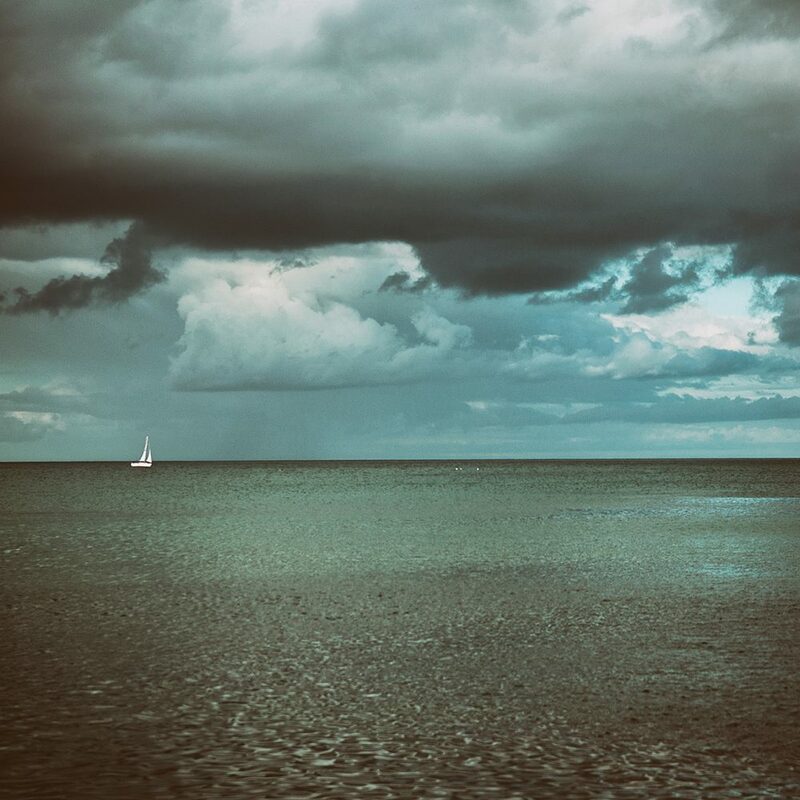 Sanda Semeika is a musician and photographer originally from Latvia who has been living in Ireland for 10 years. She is co-founder of SandS Photography. You can view more of her work on her Facebook page or follow her on Instagram. In other towns, at other times, my grandmother might have been taken for a witch. But not now, and not in East Belfast where all the old ladies practise alchemy in the kitchen, stirring their fine magic into fruit loaves, pancakes and flour-freckled soda farls. They charm their victims with kindly words. “Such a shame,” they say, and, “you must be feeling dreadful.” Or, sometimes, when one tragic circumstance has come quickly on the heels of the last, “sure, it never rains but it pours.” Each of their words is sounded out softly like something coated in talcum powder. Oh, but these old ones know exactly how to lure a lost soul in. Mostly they use the telephone but they are not adverse to cornering individuals in the street: outside Tesco’s, at the bus stop, by the school gates, with a child keening shrilly in the background. They’ve an awful eye for the weak ones. Out will come the Tupperware and the Family Circle biscuit tin, stripped of its original purpose and lined now, with paper doilies or Christmas serviettes; crushed paper cushioning flakemeal biscuits and shortbread rounds, fifteens and butterfly buns, their tiny, cake wings rising from the buttercream like actual insects poised for flight. “Eat up,” they’ll say, looming in the doorway with a recently polished teapot. And the weepy one will eat, returning for seconds or even thirds. Afterwards she’ll feel less inclined to mope. Her too-full mouth will not have room for it. Her head will run sharp on the quickness of refined sugar. “Better?” they’ll ask, and she will nod slowly, careful not to shower the carpet with crumbs or desiccated coconut. Then, she’ll rise and stumble home clutching a box full of well-meaning pastries, something to dip into when the sadness catches up. The East leans upon these women. Each one, a specialist of sorts. This old one’s wheaten is a cure for sadness. Toasted and dripping butter, it’ll take the edge off anything up to an actual death. The next one’s apple tart works wonders on loneliness. Ideally, it should be served hot and swimming in fresh, whipped cream. This other one makes stew in individual and family-sized portions; tailoring her solution to the problem’s precise measurements. It is very good stew –thick, with just the right amount of runniness- so good, it is impossible to feel anything but warmly loved with a spoonful resting solidly on your tongue. It may cause heartburn. But this will only come later when the taste of boiled meat has slipped out from between your teeth. Doubt and melancholy, absent children, philandering husbands: all can be eased, if not cured outright, by the correct food consumed in the correct manner, (more being infinitely preferable to less). The elderly ladies of the East hold themselves quietly responsible for all the local ills. They diagnose. They prescribe. They go door to door when an intervention is required. Theirs is a calling, passed from one Elizabeth/Margaret/Susan to the next. They are all cut from the same stiff cloth: stout of girth and widely hipped, capable of working miracles with an almost empty larder. Do they scrimp on the double cream? They would not dare! Not even on a trifle where the custard could easily compensate for lack of cream. They believe in home baking like it is a kind of religion and who would knowingly cut corners when it comes to the work of God? My grandmother was the queen of them all. She specialized in soup. Her icebox was a brick wall built of old margarine tubs, each one full of frozen soup. If tipped from their plastic casings her soups would have formed giant ice cubes in orange, green and puddly beige: all the colours of the vegetable spectrum. There was no room in her icebox for anything but soup, not so much as a block of raspberry ripple in the summer. Needs must and she was ready to play her part in whatever soup-based emergency the East might throw at her. Primarily she envisioned funerals, but a small earthquake wouldn’t have been beyond her catering ability. “It’s good to help a friend in their hour of need,” she’d say. This was a nice sentiment. Most decent people would’ve said, “indeed it is, Kathleen. Indeed it truly is,” nodding their heads in loud agreement. However, my grandmother could not stop with friends. She had soup enough for every sad soul in Belfast. “It’s the least I can do,” she’d say and I’d want to reply, “no, it’s not Granny. The least you could do is nothing, and give a tenner to charity at Christmas.” But I didn’t. I knew my grandmother couldn’t help herself when it came to soup. She never left home without a full thermos tucked into her handbag. It was a large handbag -more of a sack really- wipe-clean, with a specially sewn pocket for keeping the soups upright. She made a mean cream of Tomato. Also cream of mushroom. Leek and potato. Broccoli and Stilton, (this being one of her fancier recipes, clipped from the Women’s Realm. Pale, mint green in colour, with darker flecks of green graining through. It smelt like feet if left too long on the hob). My grandmother prepared a different soup for every day of the working week and, on weekends, made an enormous pot of vegetable broth, the carcass of an unfleshed chicken bobbling about on its surface like the remains of some poor creature gone swimming in an acid bath. Sometimes she’d blend. Sometimes she refrained from blending. The consistency of my grandmother’s soup depended on the mouth which would sup it. Contributing factors included age and gender, digestive ailments, false teeth and lack of false teeth, whether the recipient once mentioned liking the feel of hard carrot resisting teeth, (or mentioned no such ugly thing), season, weather and whether the soup would be taken from a mug or with a spoon from a regular bowl, ethnicity, socio-economic background and marital status. Sometimes she’d blend. Sometimes her soup stayed lumpy because the plastic bit of the blender was in the dishwasher and she could’t be arsed with fishing it out. My grandmother was almost impossibly generous with her soup. She’d stop to talk to sad looking strangers in the line for the Post Office, and on the Embankment, where they were only trying to walk their dogs in peace. She was canny, my grandmother, and knew better than to start straight in with the soup or something obvious such as, “you look sad. Can I help?” Instead, she’d say, “lovely weather,” or, “wild weather,” or, “what sort of wee dog is that?” Her speaking voice was like a shoulder gently nudging a door so the sad person would say, “it’s to rain later,” or, “it’ll clear up by lunch,” or, “it’s a Jack Russell, so it is; lovely natured wee thing,” and feel compelled to stop and talk. Ten minutes later they’d find themselves sitting on a bench or public seat telling my grandmother they did not know how to go on getting up every morning with everything as impossible as it currently was. Often they would be in tears. My grandmother would always reply, “you’re right. I don’t understand.” Because she didn’t. My grandmother was the sort of woman who’d been born standing up. She had not known major illness or hard loss of any kind. Neither had she hungered for food or money. Her eyes were permanently concertina’d from too much smiling. From time to time my grandfather would say, “she grins like a half wit in her sleep,” trying to insinuate that this was a nasty habit like breaking wind in public. He was only picking holes. My grandmother was a full-time joy. Granda knew this. Every time he considered the sour-faced old ones who lived next door and across the street, he’d realise his own good luck. “Your granny’s some woman,” he’d say to me, “she makes the best tomato soup in the East.” This was the extent of his romance. Being of a certain era -not good with sappy talk or flowers- he’d never once taken my grandmother in his arms and said, “Kathleen, you’re one in a million.” Every Friday night he’d bring her home a Terry’s chocolate orange and a bottle of brown lemonade, assuming these items capable of doing the sweet-talking for him. My grandmother had nothing to be unhappy about. Therefore she was happy. She could muster no empathy for the sad souls in the Post Office queue or those dragging their West Highland Terriers along the Embankment in the rain. But, she did have sympathy and enormous amounts of soup. “Dear, oh dear,” she’d say, “that’s terrible altogether,” or, “my heart goes out to you.” If it was a sad lady of a certain age, my grandmother would pat her hand gently, up and slowly down, like an elderly priest doling out the blessing. She was careful not to touch the young ones or men. It was easier for them to get the wrong idea. “I can’t begin to imagine how you must be feeling,” she’d say, “but you must keep your strength up.” Then she’d go fumbling round her handbag for the soup. Sometimes the stranger refused her soup, (always politely with an appropriate excuse). On other occasions they took the thermos and walked away, clutching the dull heat of it against their chest like a hot water bottle. Common sense kept them from consuming the contents but it was comforting to feel the warmth come creeping through their shirts and blouses, causing their flesh to sweat slightly. These people, though they never got the full goodness of my grandmother’s soup were, nevertheless, left with the aftertaste of it; the realization that kindness was still available to them, in small, manageable portions. Sometimes, an individual was so hungry they’d open my grandmother’s thermos right there on a park bench or public seat and tip the slipping contents into the little white mug which sat like a hat over the flask’s mouth. The steam would rise off it in white cauliflower puffs and they’d remember all the simple soups of their childhood –chicken, tomato, mushroom- and without intending to, blow their cold breath over the surface of the cup. This small act alone was enough to lift them a half inch or two above present circumstances. They’d raise the cup to their lips and feel the soup go swimming over teeth and tongue, down the back of their parched throat, to their belly which had been waiting, so long, for a little comfort. Then they’d feel braver, just for a half hour or so, cruising on the kind soup my grandmother had given them. They’d have strength enough to get them up off the public seat, down the Castlereagh Road and back through their own front doors to the troubles waiting inside. My grandmother’s name was Kathleen. Most people in East Belfast knew her as the Soup Lady. They would not have passed her in the street. Last spring my grandfather died suddenly of a stuck heart. Through the kitchen window my grandmother watched him slip down behind the lawnmower and lie on the lawn. So still was he, not even a finger twitching, she knew he was dead without checking. She did not cry nor voice any kind of wild grief. Instead she held her silence like a lap cat and prayed. She sat quietly in the corner of the living room flicking through the pages of the family Bible until she’d learnt how to hold her mouth like a lost woman. The length of this was around a month, during which she did not make soup. Nor would she consume so much as a teaspoonful of it, though we urged and implored and pointed to the icebox, stacked full of every conceivable flavour. For an entire month my grandmother lived on plain biscuits and dishwater tea. She claimed no appetite for anything stronger. Other women brought food: casseroles, fruit loaves, sympathy pancakes still warmish from the oven. My grandmother gave polite thanks. She waited ‘til the well-wishers left before passing their gifts on to visiting relations or storing them in the deep freeze, anticipating hungrier days to come. On the first morning of the second month she rose from her sad chair and made soup. Vegetable broth. Cream of chicken. Tomato. Leek and chunky potato, peeling each pale spud by hand. Her stove cluttered itself with long-handled pots, bubbling and spitting like burst volcanoes. The smell coming off these pots was a holy smell rising, as incense rises, towards the roof and the heavens beyond. Condensation fogged the windows, forming watery pools along the sill. The kitchen bench –inch thick with peel and rind- burst its banks and dripped on to the lino. My grandmother stood slipper deep in the mess of it. She raised her right hand like Christ in his boat, calming the storm, and stirred all her sadness into those soups. She used a wooden spoon. A different one for each pot. Grief can turn a good thing bitter but, when it came to my grandmother’s latest soups, it was not grief which clamoured for the tongue’s attention. Beneath the nip of tart tomatoes, the smooth blush of cream and buttered mushroom a softer taste was waiting to take hold. This was a taste like the sound of two sung voices rising in harmony. A taste like the feel of one hand slipping warmly into another, or understanding, or something the recipient was particularly hungry for. This was soup forged from the most raw and honest ingredients. The best soup my grandmother had ever made. Jan Carson is a writer and community arts programmer based in East Belfast. Her debut novel, Malcolm Orange Disappears and short story collection, Children's Children were published by Liberties Press, Dublin. A microfiction collection, Postcard Stories was published by the Emma Press in 2017. Her next novel is forthcoming with DoubleDay in early 2019. Jan won the Harper's Bazaar UK short story competition in 2016 and has also been long listed for the Seán O'Faolain prize. Her stories have been broadcast on BBC Radio 3 and 4.